Plants for the background are primarily long-growing stem, rosette or tuberous plants that grow longer than the aquatic plants in the middle and foreground areas. In water plant aquaristics and in aquascaping, you have a great number of background plants to draw upon. 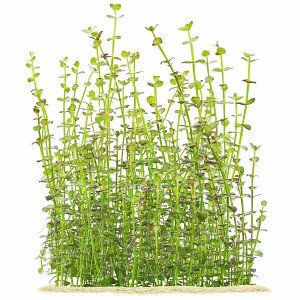 Especially fine- or small-leaved plants are great for the use in the background of an aquascape, as their small leaves lend the overall layout a sense of depth. The size relations of these plants and the tank dimensions are more favourable for depth perception than those of plants with very large leaves. Many species of the genera Rotala and Ludwigia belong to this group and make great background plants. Ferns like Bolbitis heudelotii or the especially narrow-leaved, long-growing Eriocaulon sp. "Japan Needle Leaf" can also be a great choice for the background. 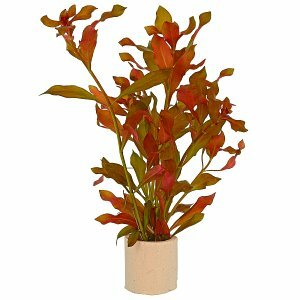 Narrow-leaved, long Crypts like Cryptocoryne spiralis are also highly suitable for this area in an aquarium or aquascape. Many aquariums only work harmoniously with tall aquatic plants in the background. 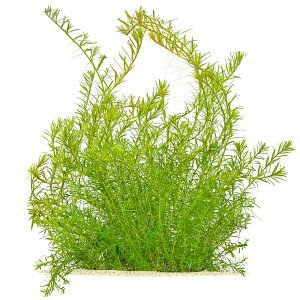 Several high-growing aquarium plant classics are suitable for background planting, like from the genera Vallisneria, Aponogeton, Hygrophila, Ludwigia, Limnophila, Myriophyllum and the Rotala rotundifolia-forms. Also various interesting plant novelties and rarities come into question for this area of the aquarium. In conventional plant aquariums, tall plants are often placed on the side walls of the aquarium tank. The aim here is to conceal the rear and side windows with the aquarium plants and to give the impression of a lushly overgrown biotope. High aquatic plant thickets contribute not least to the well-being of many fish and other aquarium inhabitants, offering them quasi-natural retreats. Leaves of high-growing sword plants such as Echinodorus grisebachii 'Bleherae' are often used as spawning grounds by angelfish (Pterophyllum-species). Very long-leaved plants such as the Vallisneria australis and Vallisneria neotropicalis, the Cryptocoryne aponogetifolia, Sivadasan's water trumpet (Cryptocoryne sivadasanii) and Crinum form surface-flooding, current-weighing populations that act like plant populations in flowing waters in appropriately designed biotope aquariums. Stocks of high plants such as Echinodorus palifolius growing out of the water in the background of open aquariums, can remind of reed banks. There are also various methods of creating plastically structured back walls, which can then be covered with epiphytic plants such as ferns, anubias and mosses. 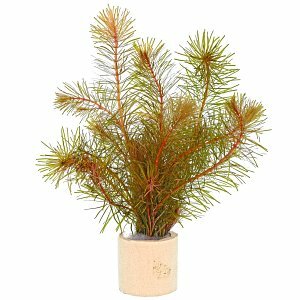 Plant pods, glass plant trays with suction cups, which are also available in our online shop, make it possible to place even smaller aquarium plants at any height on the rear pane. In Asian-influenced aquascaping, however, the aesthetics of empty space play a greater role, and the unstructured aquarium back wall in particular is a design element that can convey an impression of vastness, infinity and tranquillity. The most effective way to achieve this is to apply light self-adhesive films to the outside of the rear pane. An unobstructed view through the hardscape or middle ground plants, such as a path, tapering out to the empty back pane are a way to enhance the depth effect of the aquarium design. In more prosaic aquascapes, such as those designed in the Iwagumi style, simple aquarium plants with very narrow leaves or fine stalks such as Vallisneria nana or Eleocharis vivipara are usually used in the background. For these common plant species, interesting alternatives like Eriocaulon sp. "Japan Needle Leaf" and Eriocaulon sp. 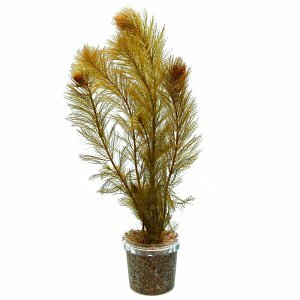 "Feather Duster" are available, which in contrast to Vallisneria do not produce runners and are therefore easy to handle. These two undemanding Eriocaulon rarities are available in our webshop, too. The perspective effect can also be increased in colourful plant aquariums designed with many different species by skilfully selecting differently structured aquarium plants. Small-leaved plants such as Rotala rotundifolia tend to be placed in the background, those with larger leaves further forward in the middle of the aquarium. When selecting plants according to their height, it is important to distinguish between stem and rosette plants. 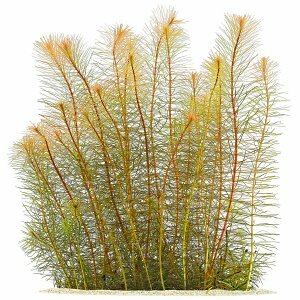 When using stem plants, such as Rotala-, Ludwigia- and Limnophila- species, they prove to be more flexible, because their height can be determined by pruning and planting cuttings. 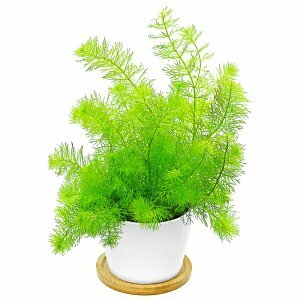 Strongly growing aquarium plants in the background will produce a nice result more quickly, while slower growing species are easier to maintain in the middle ground. 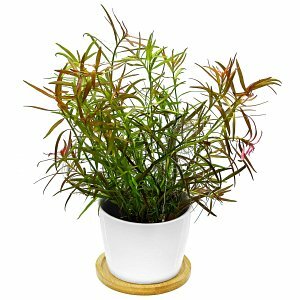 In rosette plants such as Vallisneria, Sagittaria, Echinodorus and Cryptocorynes, all leaves sit right at the base of the plant, and the maximum growth height, i.e. leaf length, of the respective species and varieties needs to be taken into account. Although it is possible, for example, to shorten Vallisneria leaves when the become too long, but this will often impair the overall appearance of the plant.